Kutvek Amerika specializes in the creation of jet ski stickers. In terms of design, we focus on originality to offer you a range of unique and creative graphics to highlight your jet ski and have done since our beginnings in 2005. We produce our jet ski stickers with a patented material in order to ensure you a quality product. Our manufacturing process places our jet ski graphic kits among the best on the market. Decorate your watercraft with jet ski stickers to enhance such components as the hull, side panels, front hood, rear cover of certain models, as well as the central parts and side rails of selected models. - Easy to apply, our jet ski stickers adapt to the shape of your watercraft under the effect of heat. And, to avoid mistakes, the glue allows you a few minutes to reposition them. 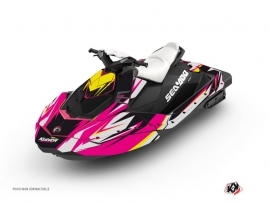 - The colors of our jet ski graphics resist fading and preserve their intensity long-term. - Our stickers have a strong resistance to water and other outdoor climatic conditions. - Our stickers provide reliable protection for your jet ski’s bodywork. The design of the first jet ski is generally attributed to Clayton Jacobson, an American motorcycle enthusiast, during the 1960s. Since then, the popularity of personal watercraft, also called water scooters, continues to grow. These recreational vehicles are so popular because they’re affordable, easy to drive, and easy to transport on a trailer behind your car. Professionally, many sports competitions are organized around the world. Non-recreationally, the jet ski can also be used by beach lifeguards for rescuing people in distress. Whether you use your personal watercraft for leisure or in competition, why not decorate it using our range of jet ski stickers ?